I find this time of year exhausting. After weeks of planning, worrying, spending, wrapping and stressing out. It’s amazing because I’m still going by the time the big day arrives. Then there’s the social side; the endless school shows and dancing performances as well as family gatherings and catching up with friends. It takes a toll on my multiple sclerosis (MS) symptoms, and I find myself wishing it would all stop! This year it calmed down a bit on 28th of December and, when I got my breath back, I found myself reflecting on the past year and thinking about the one ahead. As MS can potentially be progressive, with often disastrous consequences, it’s not always helpful to think too far into the future but looking ahead can also keep us focused and hopeful. 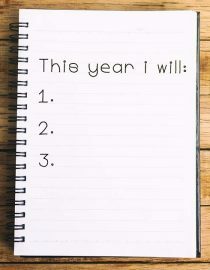 It implies there’s something to look forward to and strive for so making New Years Resolutions can be beneficial for our mental health. Here are some suggestions for New Year’s resolutions for people with MS. This one comes up with monotonous regularity, doesn’t it? With fatigue and mobility problems to negotiate as well as a job and a family to deal with, exercise is usually far down the list. Current research and advice indicate that regular exercise can help reduce fatigue, strengthen muscles and improves MS symptoms. I used to do a lot of Pilates and found it so beneficial. I find it difficult to get up from the floor these days so resolve to try seated workouts. There’s lots of advice online about seated exercise to strengthen the core, improving balance and general fitness, so that’s resolution number one for me. There’s no excuse. I’ve written a lot over the years about the impact fear and anxiety can have on our lives. I cancel 4 out of 5 social events as I’m terrified of what could go wrong. I missed my office Christmas meal again this year as I’d invented so many obstacles and barriers. This year I’m not going to allow myself to give up so easily. I have a hen weekend and wedding to attend in the next few weeks, and I fully intend not to miss out! Recent research suggests a diet avoiding processed food can help MS. A few years ago, I lost a lot of weight following MS diets, and I felt so much better. They often promise a miracle cure, and while this didn’t happen to me I did feel better and not having to lug extra pounds around with me helped. Lately, though I‘ve started to gain weight and this is due to sugar cravings and too much alcohol on weekends. I want to lose these extra pounds, so I feel and look good again. Being disabled doesn’t mean you have to let yourself go and get fat! I spend so much time sitting around. I watch TV or play on my phone, wasting hours while telling myself I’m resting. Rest is important for MSers, and I feel great after an afternoon “off,” but there are things I want to do. If you have a book to write or find a new job, don’t put it off because you have MS.
I’m often guilty of bottling things up and not sharing things with my friends and family. Living with MS year after year is tedious, painful, frustrating and scary and who wants to talk about it all the time? Reaching out to fellow MSers can be so helpful though, and I find I don’t have to explain myself as they know most of what I’m feeling already. There are groups on Facebook, a huge Twitter community, and forums on websites. I‘ve learned more from these people than all my neurologists put together. There are also local groups if you prefer more face to face interaction. If you don’t have a support network MS can send you crazy very quickly so get out there and join in. I would also suggest that we’re all different and MS can influence us differently so don’t take too much notice of what I resolve to do.